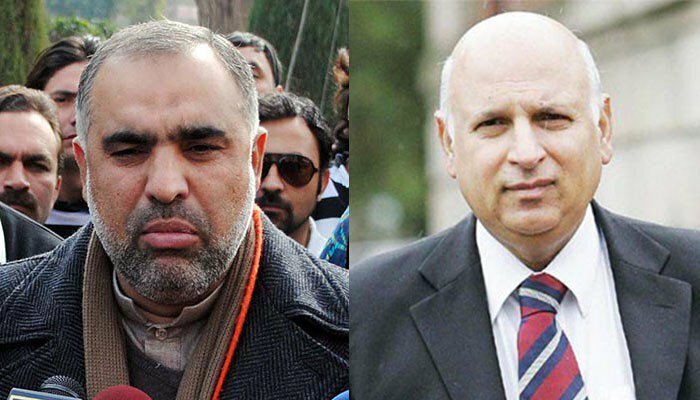 ISLAMABAD: The Pakistan Tehreek-e-Insaf (PTI) on Friday nominated Asad Qaisar for the post of National Assembly speaker and Senator Chaudhry Muhammad Sarwar for the slot of Punjab governor. PTI Vice President Shah Mahmood Qureshi briefed reporters about the party’s nominations for the posts of NA speaker and Punjab governor. “We have a clear majority in Punjab and we are in a position to form a government in the province,” Qureshi said. Qaiser, who has previously served as speaker of Khyber Pakhtunkhwa Assembly, brings a wealth of experience with him and enjoys an admirable relationship with all political parties, Qureshi told media. Asad Qaiser won PK-44 Swabi 2 constituency on the PTI’s ticket with 31,658 votes, defeating ANP’s Gul Zamin Shah during the July 25 general election. Qaiser belongs to the Swabi district of Khyber Pakhtunkhwa and graduated from the University of Peshawar before moving on to a career in education. He joined the PTI in 1996, prior to which he was a member of the Jamaat-e-Islami’s student wing. In the PTI, he has served as the district president of Swabi and provincial president of the party. Chaudhry Sarwar, who has served as Punjab governor in the past, was recently quoted as saying that he was not interested in the post. Senator Sarwar was born and raised in Pakistan, later moving to Scotland in the 1970s. He has served as a former member of the British Parliament. In 2013, he left Britain and returned to Pakistan joining the Pakistan Muslim League-Nawaz (PML-N) and being appointed Governor Punjab. Sarwar left the PML-N over difference and joined the PTI in 2015. Earlier this year he was appointed to the Senate of Pakistan on a general seat from Punjab. Qureshi added that PTI chairman Imran Khan will announce the party’s candidate for the post of Punjab chief minister. Qureshi further announced that on the night of August 13, after the assembly takes oath, Imran Khan will chair a meeting of all the PTI and coalition party MNAs to discuss their combined future strategy. “Pervez Khattak will look after the KP and FATA region, Arif Alvi will take care of Sindh. Shafqat Mehmood will coordinate with MNAs from central Punjab, Chaudhry Muhammad Sarwar will coordinate with members from west Punjab while Amir Kiyani will coordinate with north Punjab and I will take care of the coordination with members from south Punjab,” Qureshi announced during the press conference. Furthermore, Qaiser while speaking to media persons here said that he would try to take everyone along, apart from performing his duty well once the new government is formed. Speaking to media persons here, Qaiser said that he would strive to create a conducive environment in which everyone will have their rights. He said that there are no divisions in the party, adding that “everyone accepted whatever the party chairman decided”. He said that he and Pervez Khattak had performed their duties well in Khyber Pakhtunkhwa (KP) and hoped that the same would be the case in the future. The former KP Assembly Speaker said that they can hope the party will perform better in the centre on the basis of their performance in the provincial assembly. “I have been with Imran Khan since the past 22 years and I am grateful for the trust he has had in me. We have been with Imran Khan because of a vision and ideology, not for a designation. Whatever he has decided, I will attempt to fulfil the obligation,” he said. Qaiser concluded by saying that they will take everyone along and lead by example for the sake of Pakistan.